Do you like Sailor Moon? Do you like collectables? Do you like cute stuff? Then I am here to make you jealous because the Sailor Moon diecast Gashapon charms are SOLD OUT and I managed to snag a set from Jlist.com just before they ran out! All the way from Japan I present to you these pretties. For those who don’t know, Gashapons are coin-operated vending machines in Japan that are not unlike their cheaper counterparts in the United States. The difference is a toy from a Gashapon machine is a bit more expensive (about 100 to 500 yen which means a Gashapon toy can cost as much as six dollars!) but as you can see, the quality is far superior and these are actual cute things people want… as opposed to the silly slime hands for 25 cents that I would stick to the passenger’s side car window when I was a kid. 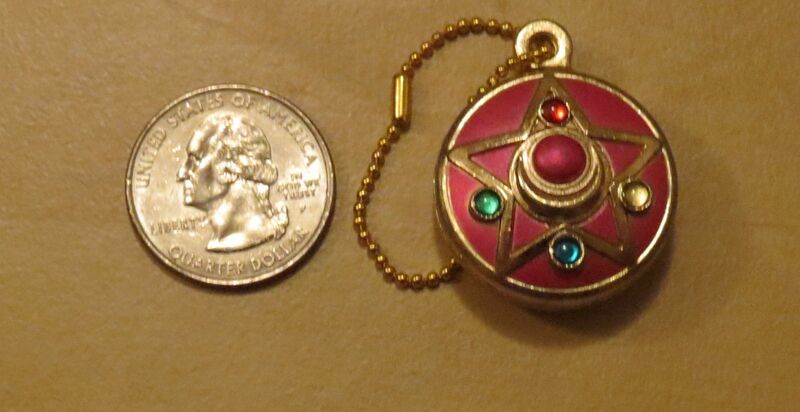 I have heard of Gashapons before I began collecting the new Sailor Moon merchandise earlier in the year (Bandai previously released very detailed transformation brooches) because I played a PSP game titled, WTF! Work Time Fun which was a bit like Wario Ware in the sense that WTF! was made up of a bunch of mini-games. The goal of WTF! was to collect money to use in the Gashapon machines so you could collect prizes… So while I understood the concept, I had no idea what it really was until I got my hands on some Gashapon prizes in real life. Just look at how amazing these are! As you can see, these are about the size of a quarter, but since they are metal, they are much heavier. They feel very nice to hold because of the weight. I don’t fear that one drop will break them. I have heard that Gashapons are pretty hit and miss, especially for collectors. Many people will buy several batches of sets to ensure that they can put together one perfect, mint condition set without any scuffs or scratches. Overall, I think I am lucky with my set since I don’t see any major imperfections. These charms are especially pretty. 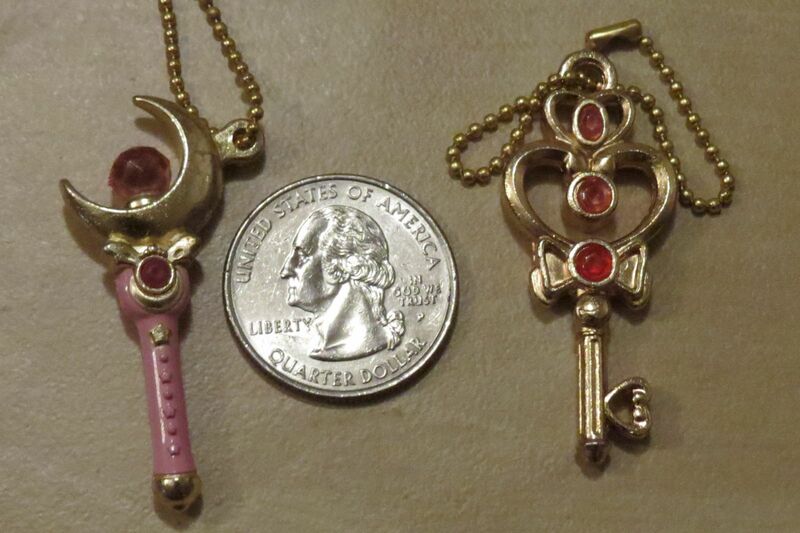 Some Moonies have turned these into necklaces. 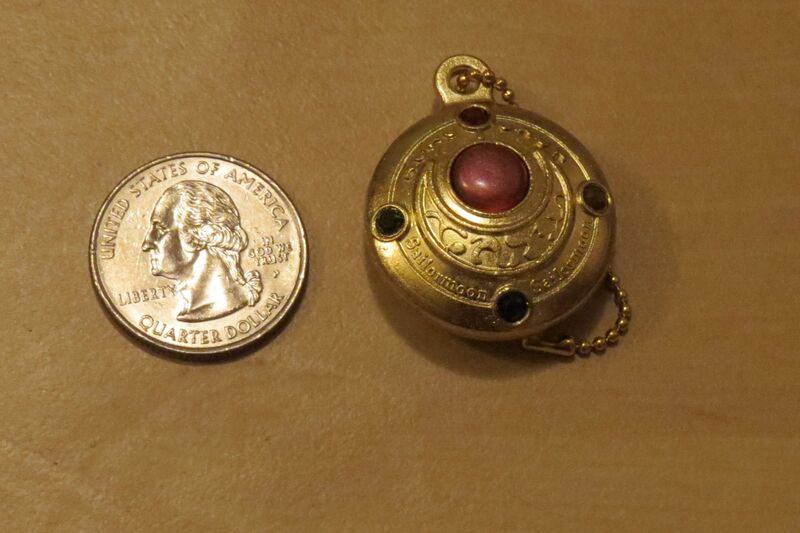 I certainly wouldn’t use them as cellphone charms since I wouldn’t want them damaged. The detail on this one is amazing, and the large pink ‘stone’ isn’t just painted on with a boring matte paint. You can really see the texture and the gem look from certain angles or with camera flash. This one is also very nicely detailed. It really transforms in brighter lighting. And you know they are all legit because of the lettering on the back side. 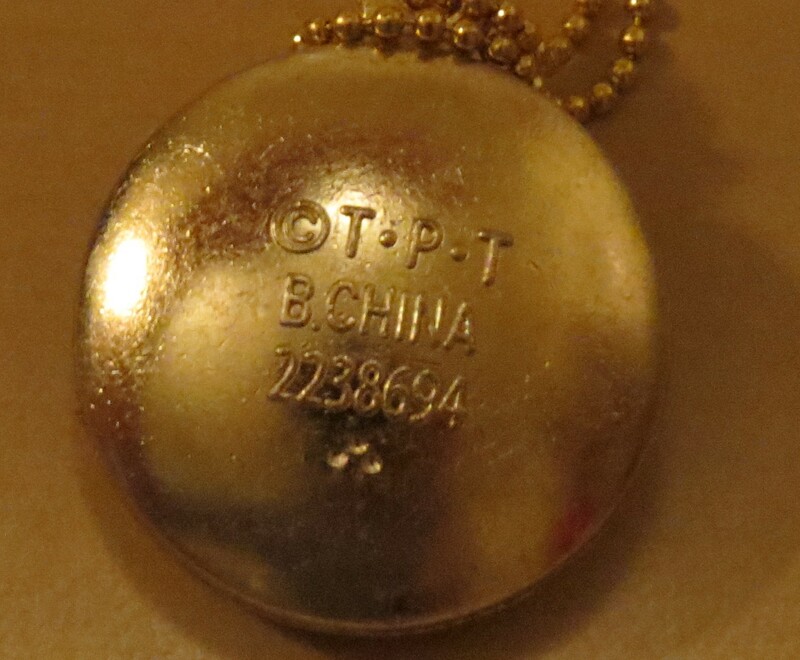 Each charm, including the smaller key and wand charms contain this lettering and number. 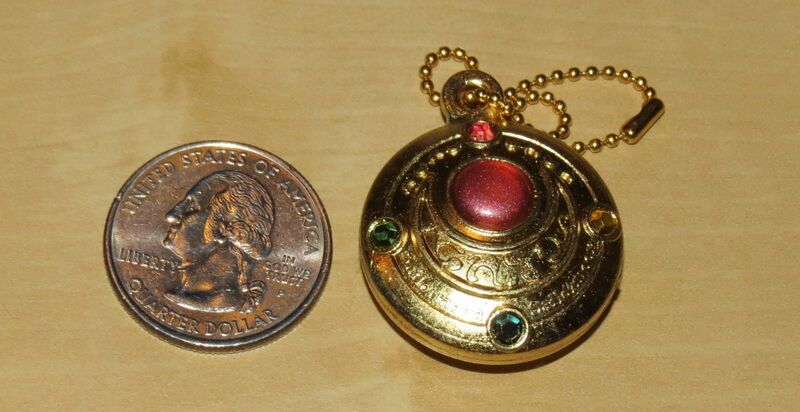 At the moment Jlist no longer has any Sailor Moon Gashapon sets, so it is important to keep your eyes open for any Sailor Moon set because they sell out quickly. You can also find these on eBay.com for around $40 dollars plus shipping. I think I paid $32 through Jlist which is a website I trust far more than random internet auctions from Hong Kong. 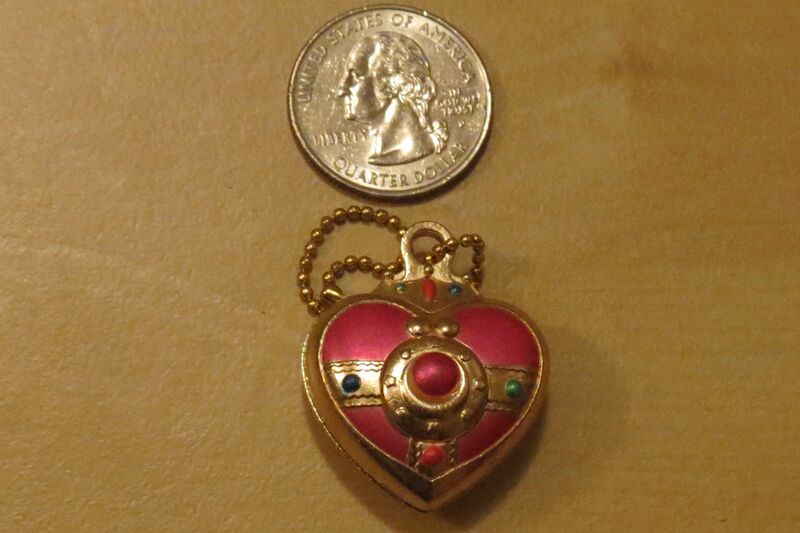 If you enjoy collecting Moonie stuff, a great resource for information is http://sailormooncollectibles.com/.